This is arguably the most sophisticated yet the most fun to use delay plugin the world has ever seen. Or heard. A conventional delay constantly processes and echoes all of the audio on the input. Multitude uses gate sequencers to control sends into four individual delay lines – allowing you to activate them at precise moments in time. Want a delay only on that particular note, chord, or hit? With Multitude, you can do this. And so much more. Multitude features a highly visualized, color-coded user interface that has been calibrated for both indoor and outdoor lighting conditions. Thanks to extensive use of OS X Core Animation and Accelerate frameworks, it provides an unusually smooth, delightful user experience – and at the same time, efficient internal processing. Four independent delay units with forward and reverse playback modes. Five gate sequencer tracks for dry input signal and four delay sends, eight separate sequences storable per preset. Eight simultaneous effect processors per delay unit: frequency shifter, sample rate and bit depth reducers, circuit bender, noise, multi-mode filter, saturation, and flanger. Effects can be placed before, after, or inside each delay’s feedback loop. Two separate modulation generators per delay unit, each with 16 modulation destinations, 8 different waveforms, and adjustable chaos feature. –- Fixed transport sync issues in certain hosts/scenarios. Multitude works with Logic, GarageBand, Live, MainStage, ReNoise, Reaper, Studio One, Digital Performer, Tracktion and other software that supports Audio Unit effect plugins. It comes in 32/64 bit format for Intel Macs running OS X 10.6 or later, and supports Retina screen resolution. Electro house beat processed with three different presets with up to four delay lines at work. Dubstep beat processed through all four delay units, with multiple effects on each – plus gate sequencer automation. Trance chord progression through one delay unit with frequency shifter and flanger inside its feedback loop. First forward delay at 3/16 note, then reverse at 1/4 note. 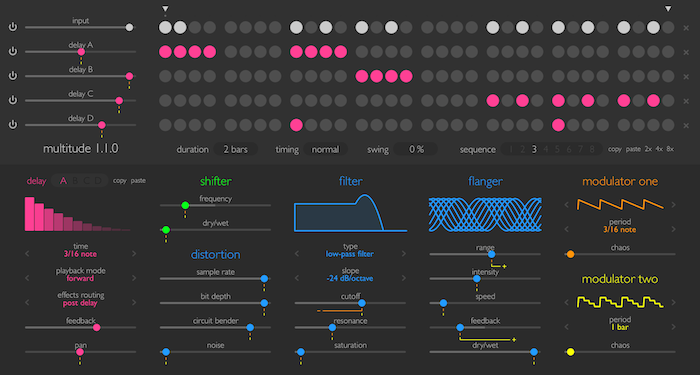 Fast arpeggiated synth going through three different single-delay presets. Synth chords going through a single delay line with a frequency shifter, a low-pass filter, and a flanger all inside the feedback loop. First with negative, then with positive frequency shifts. Another dubstep beat processing example. Four delay lines gradually introduced, with multiple effects on top - reverse delay, flanger, filter, frequency shifter. Minimal beat loop processed through different presets that make use of two to four delay units, all going through multiple effects with modulation.